Large Beautiful Home made for Family Vacations by the Sea! Sleeps 10. 2 baths. 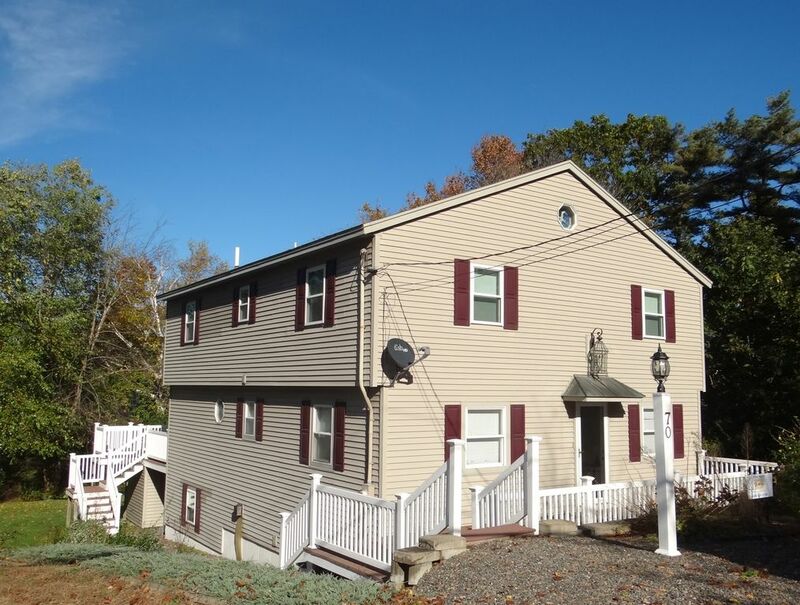 This beautiful 4 bedroom 2 bath home located in family friendly York, Maine is ideal for large families. The open concept living space has a large living room with an additional private living area that can be used as an extra TV room or bedroom with its Queen size pull out sofa. The huge kitchen/ dining area has seating for 12. The sliding doors off of the dining room lead to a gigantic deck, big enough to play corn hole on along with plenty of outdoor seating and gas grill. The big back yard is perfect for the kids to run around and play games in. On the lower finished level you’ll find another living room with TV and pool table for nights in. From this lower level out the back door is the large yard and clean, private outdoor shower with hot and cold water to wash off the sand from your day at the beach. Upstairs the 2nd story has 4 big bedrooms. There are 2 queen rooms and 2 twin rooms. The twins can be easily converted to king beds upon request. There are a/c window units to keep you cool on those hot summer days. The house is stocked for all your vacation needs. The kitchen is supplied with everything you’ll need from blueberry pancakes for breakfast to a traditional New England Lobster dinner. Quality linens and towels are provided for you along with complimentary toiletries and snacks to get you started. The laundry room has 1 washer and 2 dryers for all your beach towels! The location of this large home is convenient for walking either to Short Sands which has its sandy beach and York’s Wild Animal Kingdom along with Bowl-A-Rama, restaurants & cute shops. In the other direction is Long Sands, a sandy 1.5 mile long beach and The Nubble Lighthouse. Parking is available for 5 cars (which is almost unheard of in a beach town)! There is much to see and do from this location. From a day at the beach to exploring the quaint New England towns from Portsmouth, NH to Portland, ME. The options for your vacation are endless; lobster boat or lighthouse tours, sailing, scuba diving off the Nubble, outlet shopping in Kittery or walking around Ogunquit and lunching in one of the many restaurants. Kennebunkport is a classic quaint port town with outstanding water views from the town square that reminds one of days passed. Portland is an exciting city filled with museums, restaurants, microbreweries, shopping and tours. Choosing this house as your home base is a great choice to create lasting memories of Maine! toilet, combination tub/shower, Full bath on 2nd floor. toilet, shower, Bathroom 1 on main floor with shower. outdoor shower, Clean outdoor shower with hot and cold water. 2 Main floor living rooms and one lower level living room. Dining room table seating 8. Kitchen table seating 4. Back yard with lots of room for kids to play. Great house and location for a group gathering! The house was very clean, lots of open space on the main floor, and plenty of bedrooms. Daniele was wonderful to work with and had a warm welcoming for us. She even texted a few times to make sure we were all set. Nice short walk to Nubble Light down the street and dinner at Fox's. DISH TV didn't have much to offer, but we did enjoy shooting pool in the babsement room. Would definately rent this house again. Thank you for your great review! We are so pleased you enjoyed the house for your vacation. We also appreciate the feedback! Hope to see you in beautiful York, ME again next year! Had an amazing long ladies weekend with plenty of room for 9 of us to stay comfortably. The house had so much room. Very clean and comfortable. A place anyone could enjoy year after year. Thank you for the 5 star review! Vacation by the Sea is a great choice for a family vacation! We are so pleased you enjoyed your stay and hope to welcome you again in the future! The house is just perfect. Lots of space, great big table, open living room, great deck, lots of parking space AND Daniele, our agent, took great care of us. Loved it! Thank you for the great review Josee! Your group was a pleasure to host. What a fantastic group to kick off our busy season!